The eighth in Mike Metlay's ongoing series of mindSpiral collaborations, called mind8Spiral, took place in April of 2009, with Mike (known on Earth Mantra and elsewhere under the solo title Metlay!) joined by fellow Earth Mantra artists David Herpich (a.k.a. Emerald Adrift) and Darrell Burgan (a.k.a. Palancar). The technical and performance details of that session are available in the liner notes for the first album of collected live improvisations by mind8Spiral, Curiosa Positronica. Unlike its predecessor, which was a delightful assemblage of often diverse sonic threads, Triangulum is remarkable for its coherence. Throughout the initial excitement of the April 7 StillStream.com live show, the rising confidence of the April 10 improv, and the quiet satisfaction of the concluding Second Life show on April 12, certain themes continually arose and reasserted themselves, and suggested connections across time and space that blended them into a smoothly integrated whole. 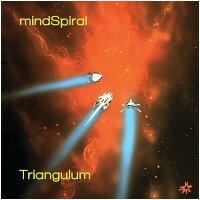 While released last, the tracks on Triangulum were actually collected and ordered first, almost turning themselves into an album with ease. The first four tracks have a heavy emphasis on the interplay of keyboard sounds (various acoustic and electric pianos mingled with synthesizers and vintage keyboard timbres), while the last four tracks intersperse the familiar keyboards with more abstract electronic soundscapes. The two halves blend to form a deeply moving experience: a gentle and meandering walk through a stark and melancholy landscape that shimmers, miragelike, with its own particular beauty. Earth Mantra is pleased to be able to release the second of the two mind8Spiral improvisation albums, and we hope you enjoy it as much as we do.